The U.S. Central Intelligence Agency (CIA) has officially confirmed that its sees the Democratic Union Party (PYD), which is headed by chairman Salih Muslum, as the Syrian wing of the internationally-recognized terror group PKK. 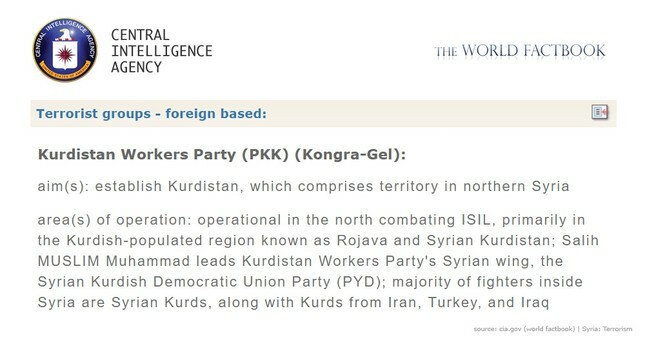 Under its "The World Factbook" section and Syria subcategory, the agency listed the Syria-based PYD as a PKK branch under foreign-based terrorist groups. The page was last updated on January 23, 2018. The fact that the CIA equates the YPG/PYD with the PKK, besides confirming the U.S.' open support to a terror group, is also legally problematic for the U.S. itself as it is against the Constitution. 18 U.S. Code § 2339B on providing material support to designated foreign terrorist organizations clearly states that "whoever knowingly provides material support or resources to a foreign terrorist organization, or attempts or conspires to do so, shall be fined under this title or imprisoned not more than 20 years, or both, and, if the death of any person results, shall be imprisoned for any term of years or for life." Similarly, section 2339A dictates that "whoever provides material support or resources or conceals or disguises the nature, location, source, or ownership of material support or resources" knowing that such support will be used to commit one of the offenses specified in the statute (destruction of aircraft, biological or chemical weapons, arson, causing injury or death, acts of terrorism transcending national boundaries to list a few) will be subject to prosecution. The U.S. Dept. of Justice also states that unlike statute 18 U.S.C. § 2 on aiding and abetting terrorists, section 2339A "does not require that the supplier [of material support] also have whatever specific intent the perpetrator of the actual terrorist act must have to commit one of the specified offenses." This revelation comes not long after State Department spokesperson Heather Nauert described the terrorist People's Protection Units (YPG) in northwestern Syria, which is the armed wing of the PYD, as "the PKK." During a press briefing, Nauert said that Turkey was dealing with "the PKK instead of fighting Daesh." However, this was not the first time the U.S. confirmed their links. Despite the previous U.S. administration's insistence on recognizing no direct links between the PKK and the YPG and the Democratic Union Party (PYD) in Syria, former U.S. Secretary of Defense Ashton Carter had confirmed the link between YPG/PYD and the PKK while testifying before a Senate panel at the U.S. Congress in April 2016. After admitting the link between the PKK and PYD, Carter acknowledged that the PKK is a designated terror group by the U.S., Turkey and the EU. A Tactical Action Report (TAR) prepared by the U.S. Army Training and Doctrine Command (TRADOC), had also confirmed the affiliation between the PKK and the PYD/YPG terror groups. PYD current chairman Muslum has also implicitly accepted that there were hundreds of PKK militants in the ranks of the YPG. 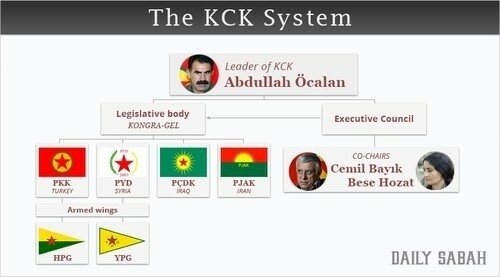 Turkish authorities labeled the PYD as the KCK's Syrian branch in 2009.